I’ve been interested in learning Disney fun facts recently. Magic Kingdom at Disney World is full of sparkle. It’s also a place with more “secrets” than probably any of the other Florida theme parks. You might be surprised at just how many little pieces of trivia stem from Magic Kingdom, the park that opened at the Disney World Resort in 1971. Here are 10 Disney fun facts that you probably don’t know! #3 – Fun Facts About Splash Mountain: The largest drop on Splash Mountain is 52 feet tall and has a maximum incline of 45 degrees, producing top speeds of 40 miles per hour. #4 – Fun Facts About the WEDway People Mover: So, what’s WED anyway? It stands for the initials of the Disney – Walter Elias Disney, that is! #5 – Fun Facts About Carousel of Progress: Located at Disneyland in Anaheim, California, during the late 1960s and early 1970s, Carousel of Progress was relocated to Magic Kingdom in 1975. However, the Carousel of Progress was originally an attraction at the 1964-1965 New York World’s Fair and called Progressland. Carousel of Progress, which has been updated several times over the years (in 1967, 1975, 1981, 1985, and 1993), also holds the title as the longest-running stage show with the most performances of any theater production in America. #6 – Fun Facts About It’s a Small World: This timeless ride features more than 300 audio-animatronic dolls and plays the eponymous song that, fittingly, is said to be the most frequently played and translated piece of music in the world. #7 – Fun Facts About Big Thunder Mountain: The mountains upon which the wild action of the Thunder Mountain railway unfolds are actually based on the appearance of the real Thunder Mountain in Sedona, Arizona. Also, a good deal of the music that you hear in the ride queue comes from the Disney movie “The One and Only, Genuine, Original Family Band,” which stars John Davidson. #8 – Fun Facts About the Utilidors at Magic Kingdom: Did you know that Magic Kingdom has a vast underground complex of tunnels so cast members can walk between various areas of the park, and deliveries and other behind-the-scenes action can happen without guests noticing? These tunnels, called utilidors, actually represent the 1st and 2nd floors of the park. 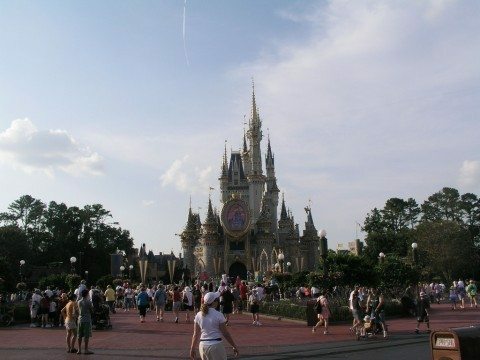 In fact, Cinderella’s Castle and Fantasyland are actually on the 3rd floor of Magic Kingdom! More than 5 million square feet of soil was excavated from Seven Seas Lagoon to cover the complex. #9 – Fun Facts About the Admission Cost at Magic Kingdom: On October 1, 1971 – the opening day of Magic Kingdom – an adult had to pay only $3.50 for admission and parking cost just 50 cents. However, back in those days, guests also had to buy tickets to ride many of the attractions. These Disney ride coupons, called A tickets, B tickets, C tickets, D tickets, and E tickets, were required to enjoy the various attractions, with the E ticket reserved for the most thrilling or interesting rides, like It’s a Small World and The Haunted Mansion. All-inclusive park tickets were introduced in June 1981, and the coupon system was phased out during the summer of 1982. #10 – Fun Facts About Opening Day at Magic Kingdom: It’s fairly well known that things didn’t go very smoothly on opening day at Disneyland in 1955. Out of caution, Magic Kingdom was intentionally opened during the off-season (October 1st is about a month after the peak-season for most theme parks ends). The official dedication of Magic Kingdom didn’t even happen until October 25, 1971, giving the park plenty of times to correct any issues that might have arisen early on. We have lots more Disney Fun Facts and an awesome Disney Secrets Pinterest Board with even more Disney facts and insider secrets from around the web.